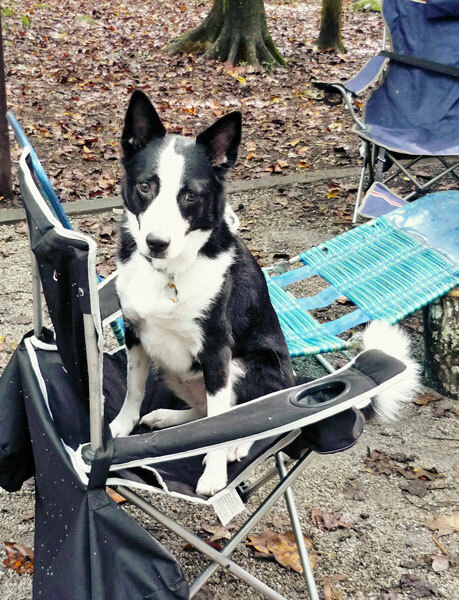 So you've decided to go camping. You've figured out where to go camping, and now it's time to make ready and pack. What do you need to pack? That's what this post is all about. Depending on where you go, when you go, and how long you go for will determine what to pack. Regardless of those factors, there are some essential items you will need for every camping trip regardless of length, time of year, and location. Keep in mind that this post is more geared to camping in a campground out of a tent instead of in the backcountry (that would require a whole post to itself and more experience than I have at this time, which just so happens to be zero backcountry experience thank you very much, but hopefully that will change come April). Let's get down to business. 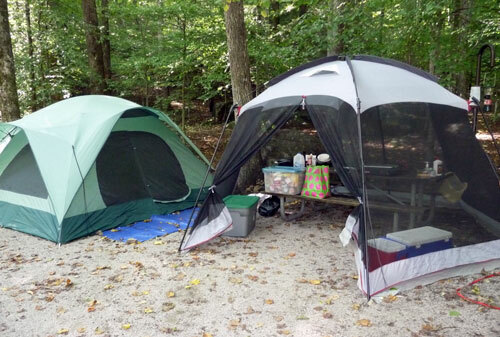 What are the essentials of every camp trip? First you need to have a tent or at least some sort of shelter be it a bivvy sack, a tarp, anything t hat will provide protection from the elements. How big or small is all a matter of necessity, choice, and personal preference. The things to consider here are what time of year are you camping and how many people do are you going to shelter. 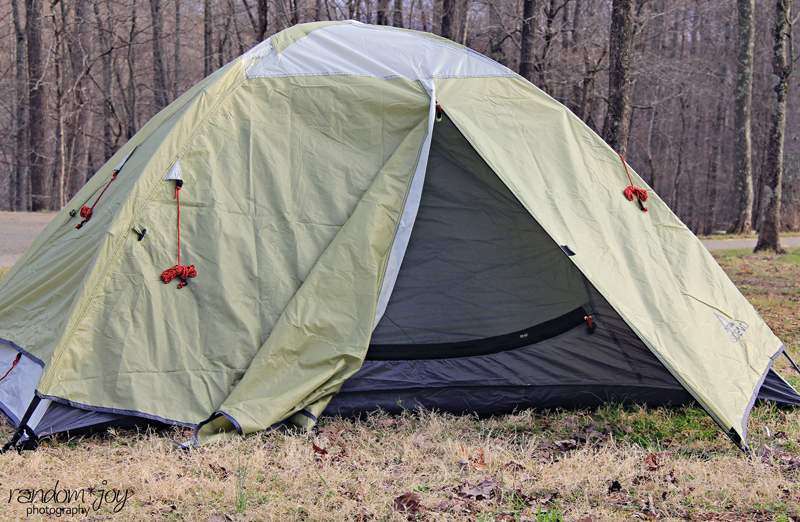 For us, we have two options, our big Eureka Tetragon 1210 tent and our Ascend Hiker 2 tent. 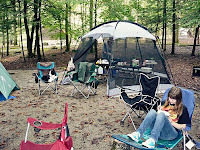 The Eureka is more of a family camp tent that we take to the campground when the whole family (Robin, Ash, the Beene, and I) are going to camp for a couple of days or more. The Ascend is our backcountry tent that sleeps two comfortably even with the Beene, and would sleep all of us but we'd be very cramped. This tent is used for backcountry trips that Robin and I will be taking in the very near future and for short overnight camp outs like we did the other day. Some of the things we consider important in tents are, floor construction (is a bathtub floor, does it require a footprint, etc). What about the seams? Are they already sealed or do we need to seal them before use? How simple or hard is the setup? Can I do it alone are am I going to need an extra set of hands? Finally, does it have a rainfly? These are all important when it comes to a tent and for everyone out there, the questions and answers will differ. That's why there are as many tent options as there are campers. The next piece of camping gear that we consider essential is bedding/sleeping gear. Okay, so this might be more than just one piece of gear but comfort is different for everyone especially when it comes to sleeping in a tent. So some items of necessity include a sleeping bag, or at least some sort of covers. Sometimes in the summer months, a sheet is really all you need of course this again all depends on where you are camping. A sleeping pad or an air mattress isn't necessarily essential but it can provide more comfort especially for us older folk who get stiff just thinking about sleeping on the hard ground. There are many different options in this arena so do your research. If we are roughing, then we will just bring our sleeping pads, of course after our impromptu camping trip we might upgrade to one of those pool floats , they are cheap and lightweight and has to be better than styrofoam. However, if we have the big tent and are out for more than a couple of days you may want to look into an air mattress or two depending on how many campers you have in the tent. Of course there's always military style cots too. If you aren't using a tent or a tarp then a hammock or a good reclining lawn chair has been known to work as well. Once you've got shelter and bedding taken care of, the next piece of gear to have is lighting. This ranges from a good lantern for the campsite, flashlights or headlights for walking back and forth to the bathhouse and trash cans at night, and going on those fun nighttime, ranger led park programs. Additionally, you are going to need something for a campfire if there are no fire bans in effect, because let's face it camping isn't camping unless you have a good campfire to tell ghost stories by or to make s'mores and roast marshmallows. In this department there are several remedies. Most parks here in Tennessee allow you to gather wood from the ground (windfall or deadfall), and some of them even have a woodshed already filled with wood. Once you have firewood acquired, you need to have something to start the fire. You can bring starter logs, lighter fluid, paper, or go the more survivor man route and have a magnesium block and flint . It's really all about preference here. Just remember to be careful and respect the fire. Now you have shelter, a comfortable sleeping arrangement, and lighting taken care of, what to do when it comes to food? You gotta eat right? Well this again is all a matter of preference. Do you like to eat well and "fancy" like we do? 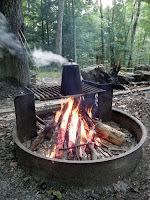 If so then check out the camp food post. 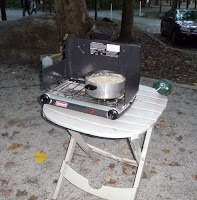 Robin covers the basics for taking care of the cooking portion of camp from Coleman stove to dutch oven, pots, pans and utensils, and let's not forget dinnerware. Unless of course you like to eat like a Marine, then you will want plates, bowls, spoons, forks, or better yet sporks. You will also need the items necessary to clean the camp dishes, unless of course you go the bare minimum route and plan on beanie wennies, vieanna sausages, hot dogs, etc. Then the most you will need is a good green stick from an appropriate tree. Of course you could always splurge and get some roasting sticks and save the tree branches. We've got the bare minimum essentials pretty well covered now with the exception of clothing. Of course I don't think anyone goes camping naked do they? Wait, don't answer that, I don't want to know. So what extra pieces can one consider to make camp life a little more pleasant? There's plenty. 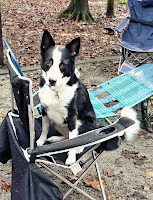 Camp chairs to sit next to the fire. It sure beats sitting on a log, a rock, or the ground next to the fire for hours. Of course if it's all you've got then it's all you've got right? Another item of luxury that we absolutely love is our food tent, a full mesh canopy. We aren't much on bugs and stuff around our food items, and it also comes in handy when there's liquid sunshine looming. Most of the campgrounds we go to have picnic tables at the campsites, and our canopy is large enough to stand up over and around the table. Another comfort item would be in the electronics department. What? I thought camping was about unplugging and leaving technology behind? Well for the most part it is, but I don't see nothing wrong with having a radio along. During the day when there's not much going on at camp or while meals are being prepared, the radio can be a welcomed treat. Another good reason to have a radio, late at night after the kids have gone off to bed and the ghost stories are done, you can tune into Coast to Coast AM and listen to the weird, unnatural, and paranormal stories and accounts. 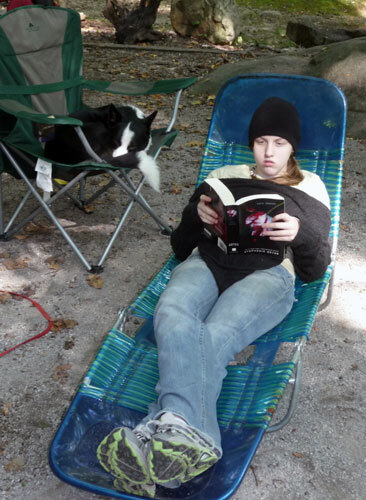 It's always a favorite pastime of ours when camping. What about bikes? Nothing wrong with bringing bikes or scooters for the kids and for yourself as well. It give you time to spend with the kids around the campground and the rest of the park. Or if you need to get supper done or want some quiet time for a nap or to read a good book, the bikes and scooters are a great way to preoccupy the kids with some good relaxation time. If there are trails available where you are camping you might also consider bringing your daypacks along so you can get up and enjoy a walk in the woods. The best part you don't have to drive because you are already there. Finally, I think another great extra to have at camp is a deck of cards or some sort of game to play. Another way to have good family time around the camp or if there's inclement weather that forces you into the tent, then you've got something to help pass the time. A good book works, too. 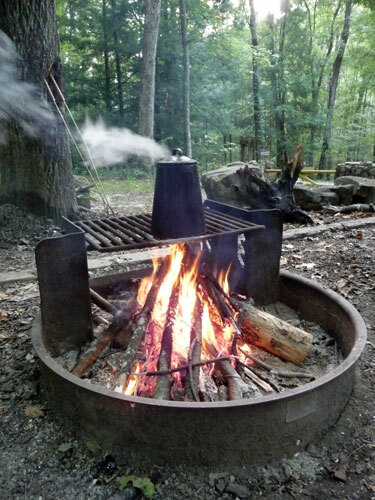 So now we ask you, our readers, what are the essentials and/or extras you like to take camping with you? 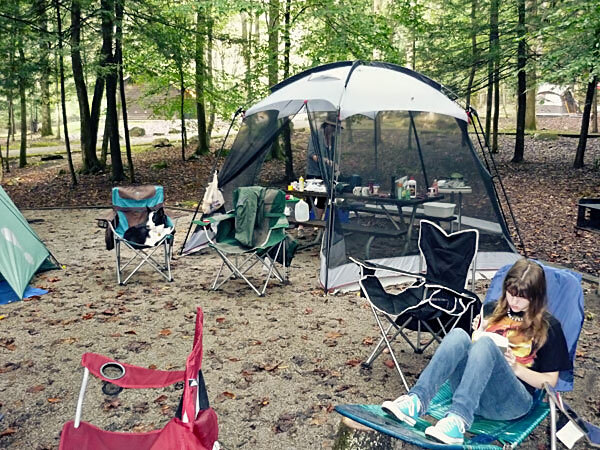 What makes camping all the more pleasing for you? Is there a particular item that you can't go camping without? Let know we'd love to hear from you. P.S. It may be a little bit overboard, but sometime you bring some real extras, of course it takes away from the whole unplugging and escaping technology thing. But hey when you can talk to someone in the Azores with only 50-75 watts of power all generated from a Jeep battery, a Ham Radio can be worthwhile during a camp trip. 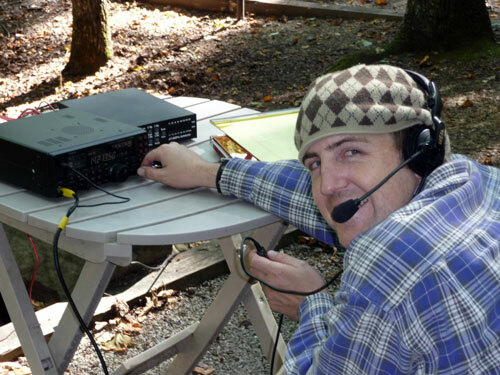 Of course you need an amateur radio operator's license first.